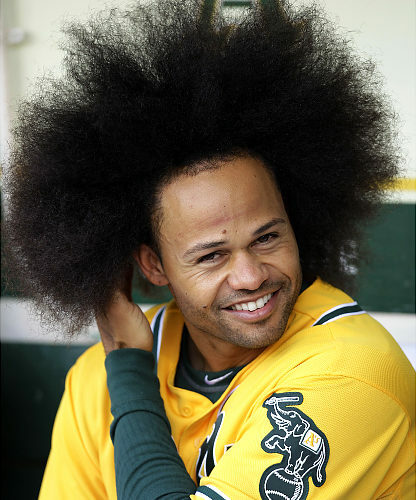 Covelli Loyce “Coco” Crisp (1979) is a big-league, switch-hitting center fielder for the Oakland A’s. Coco Crisp – yes, that’s cerealsly his name. Get it – cerealsly? Anyway, this is gonna be a pun one, folks. I hope I get a few Snickers out of y’all. Originally nicknamed Coco by his siblings due to his apparent resemblance to one of the characters on the Cocoa Krispies cereal box, Covelli would not be nicknamed Coco in earnest until he started playing AA baseball. His team had players fill out a questionnaire to get to know one another, and C. Loyce Crisp listed Coco as his nickname on the form. His teammates, thinking the sweet nickname was funny, had it put up on the scoreboard during a game. The nickname stuck like M&M’s (or Smarties, if your name’s Lavitt) to your fingers on a hot summer day, and he’s been Coco Crisp ever since. I guess since they’re still calling him that, it’s pretty clear that people haven’t milked the nickname for all it’s worth yet. Mark Grace wishes he could grow hair like that. Excellent ‘do! Anyway, onto Coco’s baseball career. It’s really a shocker, given the chocolatey nickname, that he didn’t end up throwing on big league Mounds across the nation. Although not an incredible player, Crisp has put up good numbers in 12 big league seasons, amassing over 1300 hits, 100 homers, and nearly 300 stolen bases. He’s also a one time World Series champion and has led the league in stolen bases and sacrifice hits one time each. Coco has also been involved in some interesting incidents in his career. He was once almost run over by the Mariners’ mascot, the Mariner Moose, while the Moose was driving around the field on his ATV between innings. Coco had to jump out of the way to avoid being hit. Does that make him one of the Three Mooseketeers? Coco also charged the mound during a 2008 game, sparking a bench-clearing brawl. In the brawl, he ended up breaking the pitcher into 750 Reese’s Pieces. Kidding, kidding…but I’m sure he wasn’t feeling any Almond Joy when he was suspended 7 games (reduced to 5 on appeal) for his antics. Coco is of Afro-Puerto Rican descent, with a touch of Italian ancestry. He is married and has three children. I know. That’s a fantastic head of hair, to go with an incredible name! Lucky guy! His most hair-raising incident? When teammate Dee Haynes introduced him to yours truly at the New Haven Ravens (AA Eastern League) 2001 “Meet the Team” dinner. The rest is history. That’s awesome! I can’t believe you’ve met COCO CRISP!!! That was before anyone knew who he was. He only played half the season here in New Haven that year before being traded to another organization. That’s awesome, Coco Crisp and the New Haven Ravens both have a nice ring to them as well. Also, I am posting a link to this story on The New Haven Ravens Alumni Team page on Facebook. It will follow a story on there about the retirement of probably the most accomplished ex-Raven of all time, possible future Hall-of-Famer Todd Helton. I never did meet him, but saw him play many times here. Sadly the Ravens were sold and moved away after the 2003 season. I still miss them. Oh, and correction, it was 2002 when Coco played for the Ravens. Dee Haynes was one of several players who stayed with us in our role as host family during the Ravens 10-year tenure. Todd Helton is a classy guy! Can’t believe his career ends Sunday. I remember when he was one of the scariest hitters in the game. Darn, now that Rob titled it my white album goof doesn’t work anymore. Well, before they totally jump the shark, I hope at least once to take it to the next level: write blurbs for my own blurbs, and go out in a blaze of gratuitous, self-indulgent, self-referential glory. Very cool. Going out in a blaze of anything is for sure a fun show. Thanks, guys! I love making this kind of stuff up. I have a much harder time with reality. But seriously, the post was great. Smarties !!! Nice one, Carlson. You know how much I love my (Canadian) chocolate in the mornings! You crack me up. Does that mean you want to (Hershey’s) Kiss him?!? You know very well that any Mars-velous thoughts I may have about (Hershey’s) Kisses involve a certain other Mr. Goodbar. Ooooohhh, I feel the deep pangs of rejection here, Amb. Meanie! First of all, my Sweet (Marie), I don’t know nearly enough esoteric baseball trivia to make you happy. Second, I’m officially out of chocolate bar puns. Hahaha yes it could! That is not one of my requirements. I do hope to meet someone who is baseball-tolerant and at least knows the rules though! it would be difficult to date a girl who isn’t down for a game at least once in awhile. Chocolate puns and baseball fun. Glad the Mariner Moose didn’t take out the star of today’s post. Are you a Mariners’ fan, Fannie? Since their inception. 🙂 Win or lose, I attend at least one game a year. Awesome! You sound like a diehard. 😉 Are you familiar with the Seattle Pilots? They were a Major League team for one year before moving to Milwaukee. Their biggest claim to fame is being a major subject of sports’ first real tell-all book, Ball Four, by Jim Bouton. I remember the Pilots, but I’d never heard of the book before. I’ll have to check it out. And where Sick Stadium once stood is now a big box hardware store with only a plaque in the parking lot. Sigh. That is sad! Although it wasn’t one of baseball’s most beloved stadium’s. Ball four is a great book, though. The Mariners were the parent club of the New Haven Ravens c. 1999-2000. I have a Mariners jacket given to me by ex-major league outfielder Henry Cotto who was the hitting coach for the Ravens those two years. Henry is now a roving minor league instructor for the SF Giants. That is so cool. I didn’t know that bit of history. I’m impressed you have an M’s jacket given to you by Henry Cotto. He sure doesn’t look like no Butterfinger! Nice post, Chocolate Rob! Thanks…ummm…Sauna Arto! 🙂 Have you ever tried to eat M&M’s in a savusauna? That sounds like a sticky proposition. It sounds most sticky indeed – though they may become infused with a pleasant smoky flavor so might be worth a shot after all! Haha! Smoky M&Ms, sounds tasty. I agree. I think the two of you should See’s the day by cornering the cereal (and chocolate) market. You go Liz and Rob! Gotta love them Fruity Pebbles! It’s good that Mariner Moose didn’t Rolo-ver him! Your puns make you sound like a Smarty pants. Haha, indeed! I was actually trying to think of a Rolo pun, but couldn’t come up with anything. Good work!